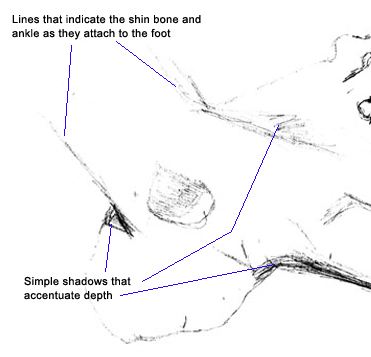 Applying basic drawing skills - do you know these five? 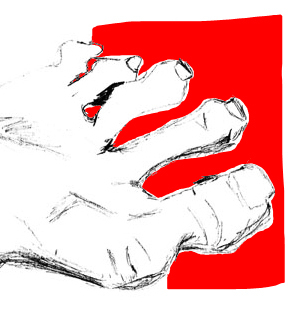 In no particular order, there's three pictures: the hand - close up, a potted plant, and a foot - all three very interesting subjects to draw. page to the more in-depth look. 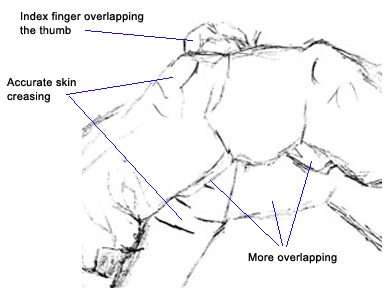 Overall, I like the composition: the hand is placed on the paper in a left to right diagonal direction - much more interesting than the "front and center" positioning in a lot of early drawings. But I doubt JW was really even thinking about that because it looks more like she was just plain enjoying her drawing session. It's not a requirement of pure contour or modified pure contour to get any kind of accurate proportion - that's down the road several steps. 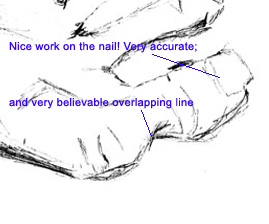 And I only say that because there seems to a little disproportion between the size of the fingertips compared to the rest of the hand -- but without seeing the hand JW was drawing I can't say that because this may exactly how the hand she drew looks. 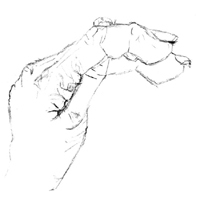 Either way, I'm not worried: the way she popped into r-mode is so well demonstrated in those fingertips and fingernails. And that's the purpose of these early lessons: learning to access at will the part of the brain that is pure observer. 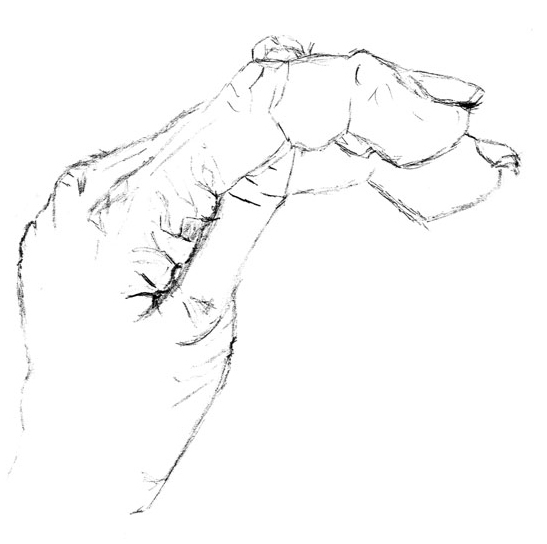 It's always a great warm-up exercise to spend about 5-10 minutes exploring a highly detailed subject (like a small section of your hand) and look for ever deepening layers of detail, of contour, of shared edges. And then recording those details as you see them: tiny increment by tiny increment. 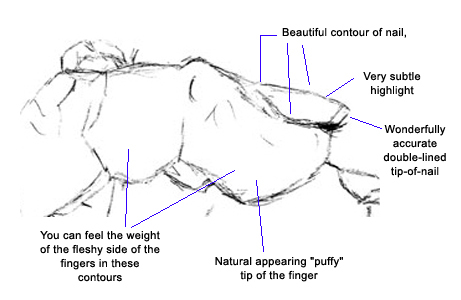 And that's exactly what pure contour drawing is all about. This is awesome practice too when you begin drawing the features - and especially in caricature: where it's literally those tiny, minute and subtle details that make a picture "sort of look like the person you're drawing" versus nailing a likeness. Right off the bat I'm struck by JW's sense of composition: there's a nice diagonal; flow to the drawing -- and again, in a modified contour drawing, composition isn't anything I'm concerned about. But I think JW has an innate sense about it. The next observation I have is the way light and dark pop off the page: very nice shadowing JW. Very accurate. Also note the overlapping of the large leaf almost dead center in the drawing: again very accurate shadows and a sense of depth. (Notice it's "figure 8" shape too). 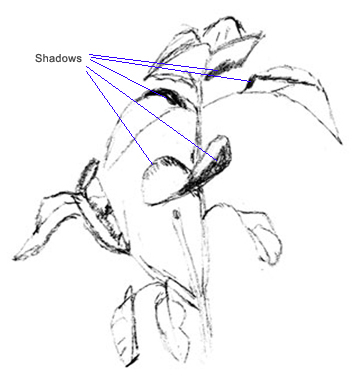 The shadowing has a rhythm to it too - a rhythm you actually see in nature. 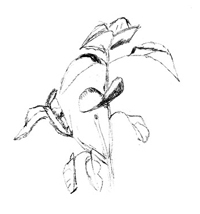 I also very much like the the line work on the two leaves towards the top of the center stalk as well as on the leaves at the bottom to (to the left of the main stalk). 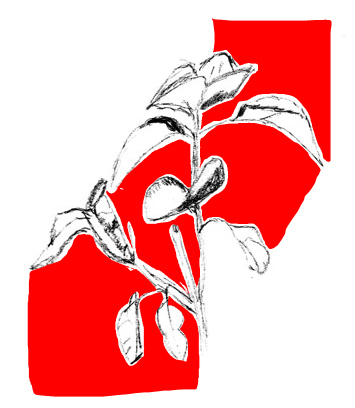 Drawing plants is also great negative space practice. 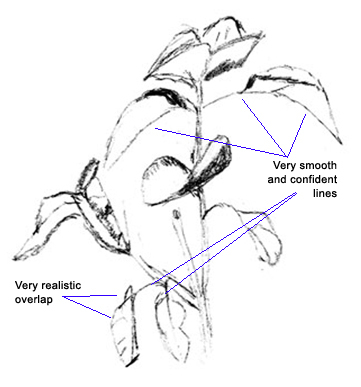 For instance, seeing those shapes formed between the leaves and stalks -- seeing them as unique and separate shapes and spaces can help you capture accurately the outline shapes of the leaves themselves. 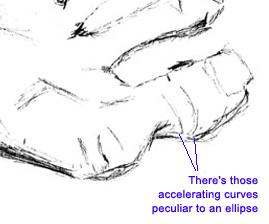 Note in the picture above how the curve accelerates (i.e. 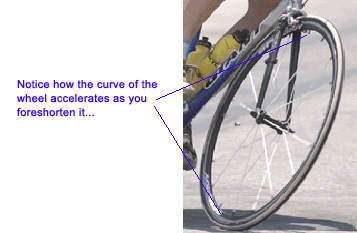 gets tighter and tighter) as you approach the edge of the toe just like on the edge of the tire above. 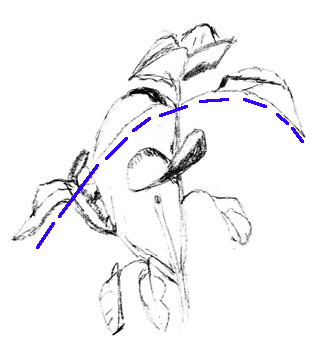 Capturing this curvature is just a matter of drawing what you see -- and with time and practice, the smoothness of all your lines will improve. 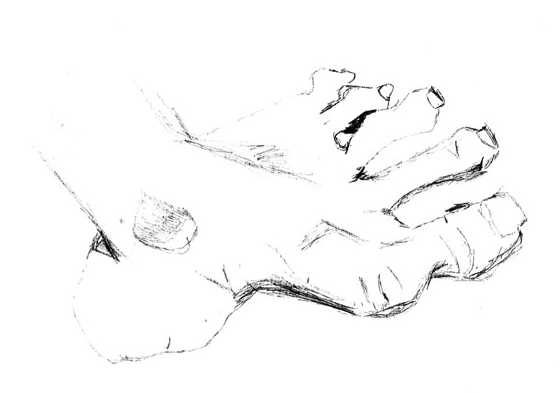 A couple last details here: I really like the treatment of the toes and toenail on the big toe (in fact all the toes -- the 4th toe even looks like it has a little "onychomycosis": i.e. a fungal infection of the nail...but that's just me reading in probably more than what's there...JW please comment :-) It's clear to me JW spent most of her foot drawing session steeped in her artist's brain. Again I'm not worried at all. There's so much proof all over your drawings JW you're getting well into r-mode (artists brain, right side of the brain, in-the-moment"...), and that's the only goal of these early lessons. Jessica (...W. from Quincy, MA), keep at it! You're doing wonderfully. Thanks again for your willingness and courage.